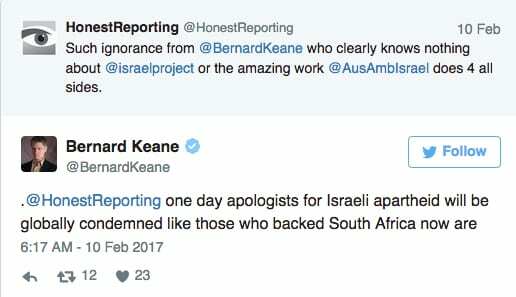 Australian news outlet Crikey‘s political editor Bernard Keane has posted a completely inaccurate and unwarranted attack on Australia’s Ambassador to Israel, Dave Sharma, as well as The Israel Project organisation…according Honest Reporting. Does DFAT [ Australia’s Department of Foreign Affairs and Trade] support Israeli settlements? So why is “Ambassador Dave” working with a group that actively promotes the key threat to the two-state solution Australia supposedly supports? 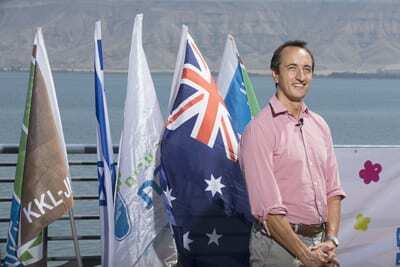 Australia’s ambassador to Israel, Dave Sharma, already has a poor reputation in Palestinian circles for his support for the Israeli government. And despite Australia’s supposed support for two-state solution to the Israeli occupation of Palestine (now dead in the water thanks to incessant Israeli settlement-building on occupied land, illegal under the Geneva Convention), Sharma appears happy to demonstrate where DFAT’s sympathies lie. Yesterday, Sharma tweeted about an “embassy workshop” on “on trends, challenges, scenarios on Israel’s northern border”. With whom was the workshop conducted? As confirmed by another tweet from the Austrian ambassador Martin Weiss, a group called “The Israel Project”. Who are they? The Israel Project (TIP) is a US pro-Israel body “devoted to educating the press and the public about Israel while promoting security, freedom and peace”. TIP is a strong supporter of Israeli settlements and has commissioned consultants to test the best ways to convince Americans to back them. TIP even attacked outgoing secretary of state John Kerry for his anodyne statement in support of a two-state solution. “The job of an ambassador is to promote his or her country’s interests and to serve as a representative of that country. This also involves keeping his or her country’s government abreast of developments taking place in the country to which he or she is appointed. The reason that Ambassador Sharma is well-regarded in Israel is because he has made sure to educate himself and his countrymen of the complexities of Israel’s political, social and security issues. He has done this by cooperating with any number of organisations on the ground. What does this have to do with the issue of settlements as brought up by Keane? Like any number of non-governmental organisations that deal with Israeli public diplomacy and related issues, The Israel Project does not advocate for settlements as Keane accuses it of. TIP is involved with explaining and educating about Israel so that interested parties are able to make informed judgements. And Keane’s evidence? According to his Twitter feed, a Newsweek story from 2009 “exposing” an internal TIP document produced by a polling expert Frank Luntz. Polling different focus groups to find out what messaging works and doesn’t work on various issues is fairly standard for companies, organizations, corporations and even states, in this case Israel. Settlements was but one question that focus groups were polled on. Keane clearly didn’t take much notice of the Newsweek story or the TIP document. If he had, he would have realized that TIP, far from actively promoting settlements, was merely flagging the issue as one of the most difficult to present to an outside audience. TIP is an established and respected organization and doesn’t need HonestReporting to defend it. Likewise, there is nothing sinister or remotely controversial for Ambassador Sharma to work with TIP or any other similar mainstream “pro-Israel” organisation. For Bernard Keane, however, it’s clear that this isn’t about settlements or TIP at all. It goes far deeper. Try telling that to Ambassador Sharma or TIP. In addition, Crikey is a member of the Australian Press Council, which is a measure of how it views itself as a professional media organization. Dave Sharma is an outstanding example of someone who is not afraid to articulate the truth as he sees it on the ground. Instead of spouting the usual diplomatic double speak he brings a refreshing Aussie candor to the diplomatic corps. A pity that more of his colleagues do not follow his example. What’s all this about a “two-state solution”? The Arabs who call themselves “Palestinians” already have two states: The State of Gaza and the state of Jordan. The reason that they want more than just the autonomy which they already have in Judea and Samaria is that full independence would facilitate their final solution for Israel, annihilation. The independent State of Gaza has shown us what “Palestinian” Arabs do with full-fledged independence. Not the first time Keane said something stupid. At least Crikey apologised for that particular oversight.